by My Yellow Farmhouse - Cooking with Love! This dish is easy and quick to prepare, and the flavors are subtle and delicious. 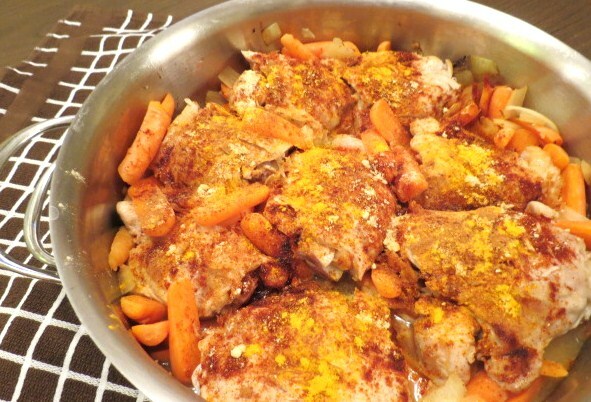 You may be surprised by how tender the chicken thighs become in 30 minutes! The chicken and veggies can be made a day ahead and gently warmed while you prepare the couscous with raisins and slivered almonds right before serving. ++ I love reading your comments/suggestions etc. To comment, scroll down past the recipe. Add about 2 Tbs. olive oil to a large saucepan which has a lid – or Dutch Oven. Lightly brown 4 chicken thighs over medium heat. Repeat with the last 4 chicken thighs, adding a bit more olive oil if necessary. Set chicken thighs aside. ++ Don’t brown the chicken too much – you don’t want to toughen it. ++ Don’t worry if some bits of chicken stick to the bottom – those ‘bit’s will just add flavor to the dish. Add 1 onion, cut in to chunks, and cook for 3 minutes. Add carrots – cook for 2 more minutes. Add 2 tsp. paprika, 1 tsp. ground ginger, 1/4 tsp. turmeric and 1/8 tsp. cinnamon. Cook, stirring, for 1 minute. Pour in chicken broth – OR – hot water and bouillon cube. Add the lemon juice – OR – 1 lemon cut into wedges. Place the 8 chicken thighs into the pot. Bring to a boil. Lower heat to a simmer. Cover pan and simmer for about 30 minutes, turning chicken at intervals. That’s it ! Your family and friends…. and maybe even your kids…. will be impressed — Enjoy! My Yellow Farmhouse - Cooking with Love! Sure, it's necessary to eat to survive - but that's not any fun!! The fun comes from cooking, serving and eating with lots of love, I began this blog to share some of the delicious recipes I've gathered over the years. Thanks for dropping by & sharing the love! View all posts by My Yellow Farmhouse - Cooking with Love! You know it’s been so long since I had couscous for a meal. The one you’ve made here makes my mouth water. I can imagine ladling some chicken stew on the bed of couscous and serving it at lunch time. I tend to eat more at lunch time. Thanks for sharing such a great combination of food! Thanks!! The Moroccan Chicken was really tasty. PS Liz !! I agree – this would be excellent with any kind of rice… I particularly like Basmati ! This meal sounds really delicious and I love eating chicken thighs. They taste very different from other cuts of chicken. I love the short time it takes to make the chicken (easy is my 2014 magic word) . I want to cook without stress. This would go well with steamed white rice too or some sticky rice. Lovely! have a nice Sunday. You made me laugh yet again!! I, too, don’t always like raisins but I do in this dish. Like you said, you could always add some other type of fruit such as chopped dried apricots or even dried pineapple – or – no fruit as all, as you also mentioned!! And thanks again for making me laugh!! This is right up my alley. I hate raisins, I know, I know. But I could just use some other dried fruit. Yes, I make a distinction, you’re free to laugh. Anyway, this looks like a great meal! 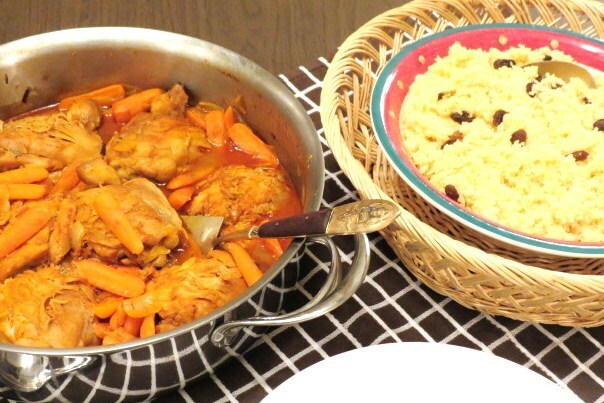 I love cooking Moroccan chicken…it is so flavorful and yours sounds terrific. Yes – it’s great!! I just wish I had more people here in Western Massachusetts who were ‘adventurous eaters”! I have chicken drumsticks and harissa … and some free time. 🙂 The whole meal looks very tasty. I meant to say that I was going to combine your dish with ChicagoJohn’s mentioned harissa for some heat but it didn’t come out right. Sorry. I can only imagine!! I went back to school when my twin sons were eight – I got a 2nd Associates in RI, then we moved to NYC – where I got my undergrad. in English Lit., then we moved outside of Philly, where I got my M.Ed. – It’s A LOT of work… I, too, haven’t been posting or even keeping up with other people’s posts lately – but now that it feels like spring – I’m ready to dive back in!! Tell me, what are you studying? What a bright, happy and delicious looking dish, Cecile! I love that you were inspired by your experience in Malta. Moroccan food is something I really love and hardly ever get. Your flavors here are so enticing and your recipe sounds so easy…I really may have to give this one a try soon. I particularly love that this cooks in 30 minutes, which is perfect for my hectic schedule right now. Thanks for sharing! Great to ‘hear from you’! I do think you’ll like this one AND I know we all love something that tastes good without lots of time & effort!! Sorry I have been so absent. I’m basically back in school right now and that and working have put a crimp in my blogging, reading and commenting! I am woefully behind reading and commenting on everyone’s blogs but, seeing this one in my inbox, I just had to check it out, Cecile. Tonight I prepared a chicken dish made with harissa and served it with couscous. Though different from the delicious meal you prepared — and not nearly as authentic — both contain some of the same flavors. I’m kicking myself, though, for leaving raisins out of my dish. I forgot. It’s such a drag getting old! Anyway, great dish and one that I have to mak ! Thanks for sharing another of your recipes with us. As always, you are so sweet & thoughtful John. 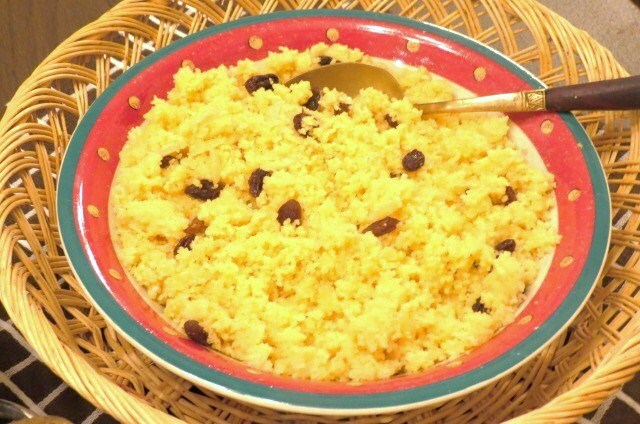 The original recipe called for currants in the couscous but raisins are a good substitute and give the dish a little hint of sweetness. Don't miss a new recipe - become a follower of My Yellow Farmhouse!